A few weeks ago, I received an email from Chelsea Leigh Trescott, a break up coach, columnist and host of the Thank You Heartbreak podcast. 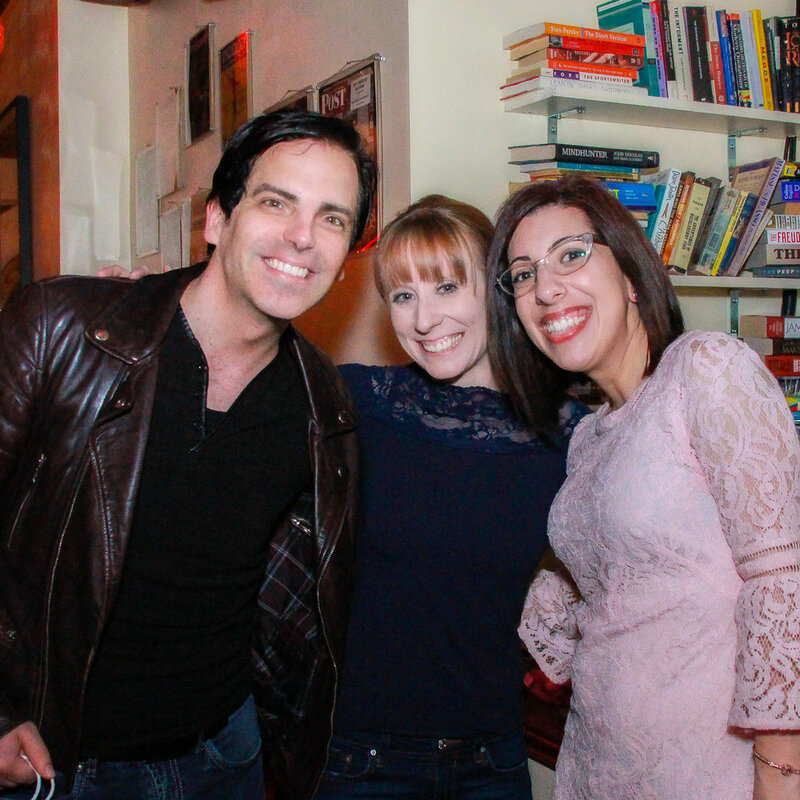 As Chelsea and I connected over email, I could quickly see that our thoughts on break ups were very much in line with each other, and I agreed to be a guest on her podcast. It was a really cool experience, because basically, Chelsea let the tape roll and we went with it! 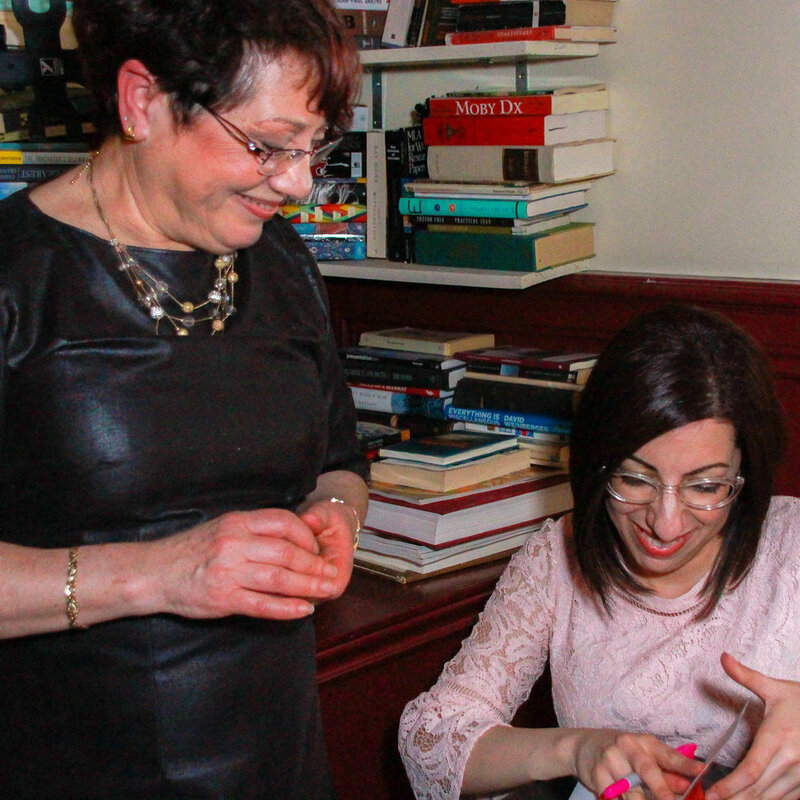 There’s very few edits, and you get to hear us both speak completely off-the-cuff, including one moment where she absolutely stumped me on a question - but it turned out to be a beautiful revelation of my current frame of mind. You’ll know it when you hear it! Chelsea also gives me a very generous and super flattering introduction that made me blush the first time I heard it! In the podcast, we speak about the difference between happiness and joy, the benefits of therapy, vulnerability, rejection, and so much more. I’m pretty proud of this one, so I hope you’ll like it! Leave me some comments and let me know what you think. Available on Soundcloud and iTunes. 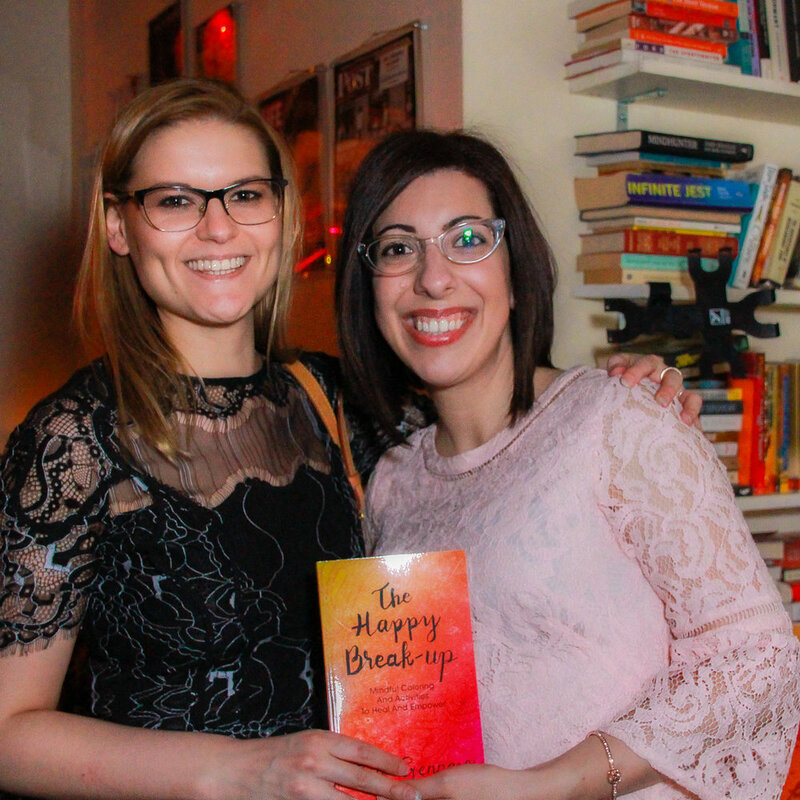 The Happy Break-up: Launch Party! 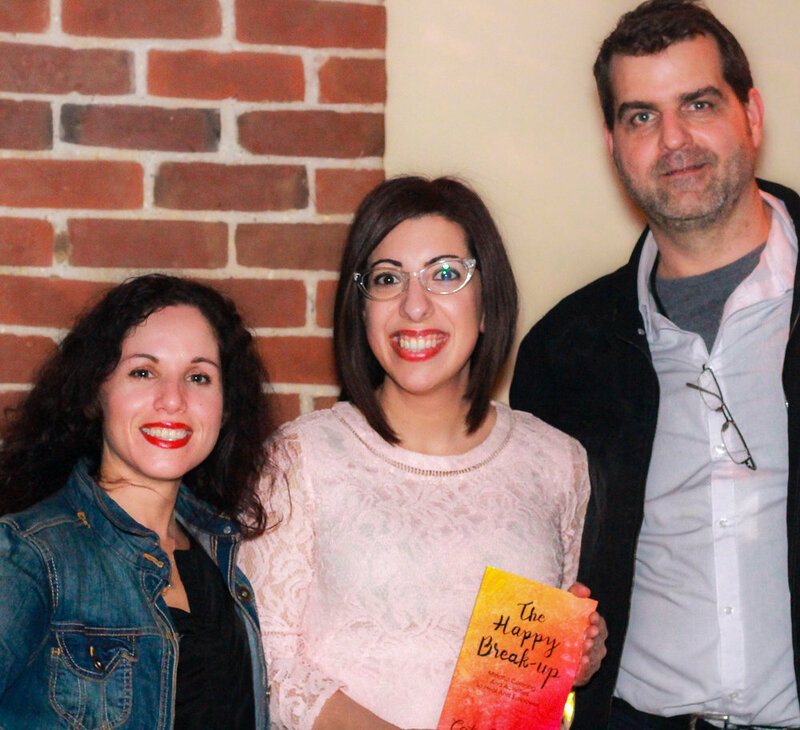 On Wednesday, April 25th, we hit the ground running, and officially launched The Happy Break-up out into the world, with a launch party that took place at Tequila Bookworm in Toronto! 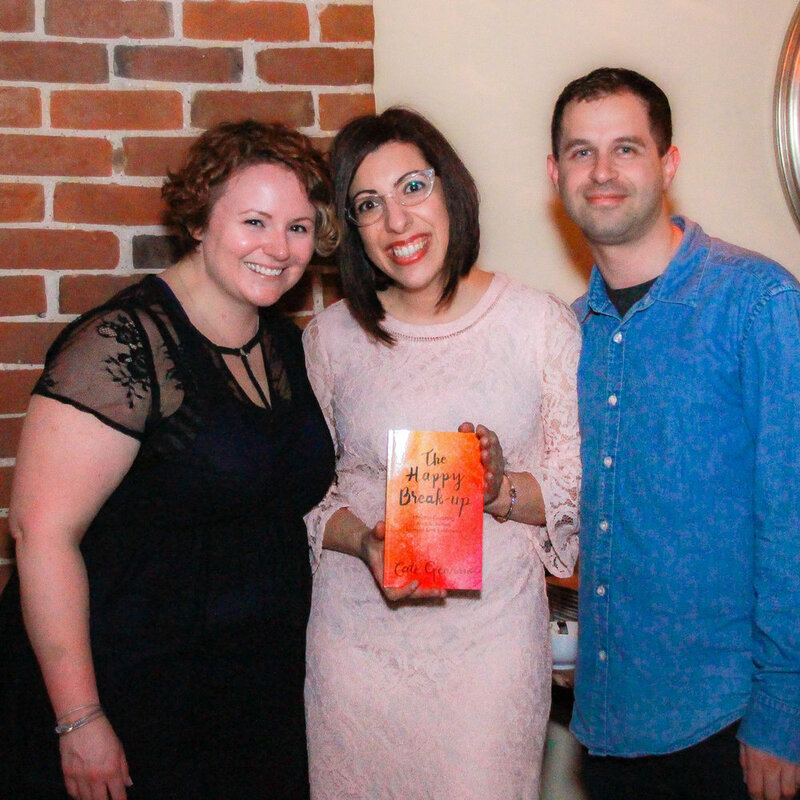 It was a beautiful night, celebrating the hard work that went into making the book, celebrating women, celebrating empowerment and love. I recently received photos from our photographer, Lila Beijer, and wanted to share a few of them with you all! Enjoy! Check out my facebook page for more. Aah, music: the heartbeat of life. I don't know about you, but when I go through a breakup, music suddenly becomes so much more relevant. And, my music must follow a theme - kind of like the stages of grief. When I'm feeling sad, I only want to listen to sad songs. When I'm feeling angry, the songs are filled with rage. I know I'm getting to a pretty great place when I'm ready to listen to my "powerful" playlist - all about empowerment and strength. So, just for you on Online Launch Party day, I've created three different playlists with some of my favourite break-up anthems! First up, we have "sad". Our Lady Peace - Are You Sad? "just stop pretending when they say you're nothing"
"I wish this would be over now, but I know that I still need you here"
"It just reminds us of the cost of everything we've lost. Bad timing that's all"
"Well, I heard she's great and her new boyfriend's lame, She can go to hell I'll never be the same!" Then you'll wish that you could kiss me when you're old and you're alone"
"And every time you speak her name does she know how you told me you'd hold me until you died, 'Til you died, but you're still alive"
Finally, we move into my favourite playlist: "Empowered". "I went from zero, to my own hero"
And it turns out he was a missing person who nobody missed at all"
If I'd known for just one second you'd be back to bother me"
There's lots more awesome music on those playlists, so make sure you check them out. 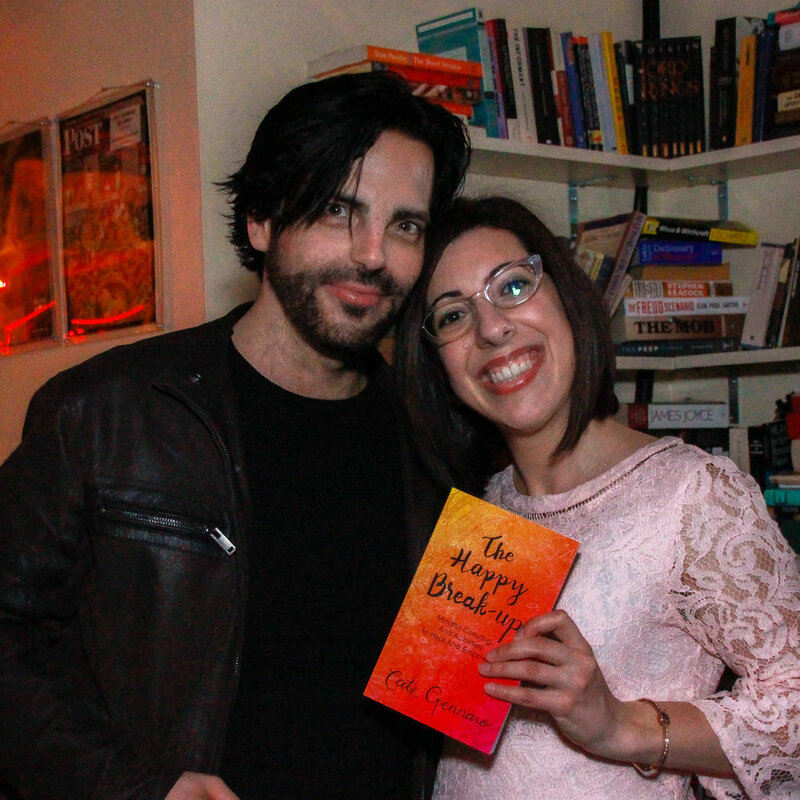 This post is part of The Happy Break-up Online Launch Party event. Follow that link to come chat with us about break-ups, music and more! 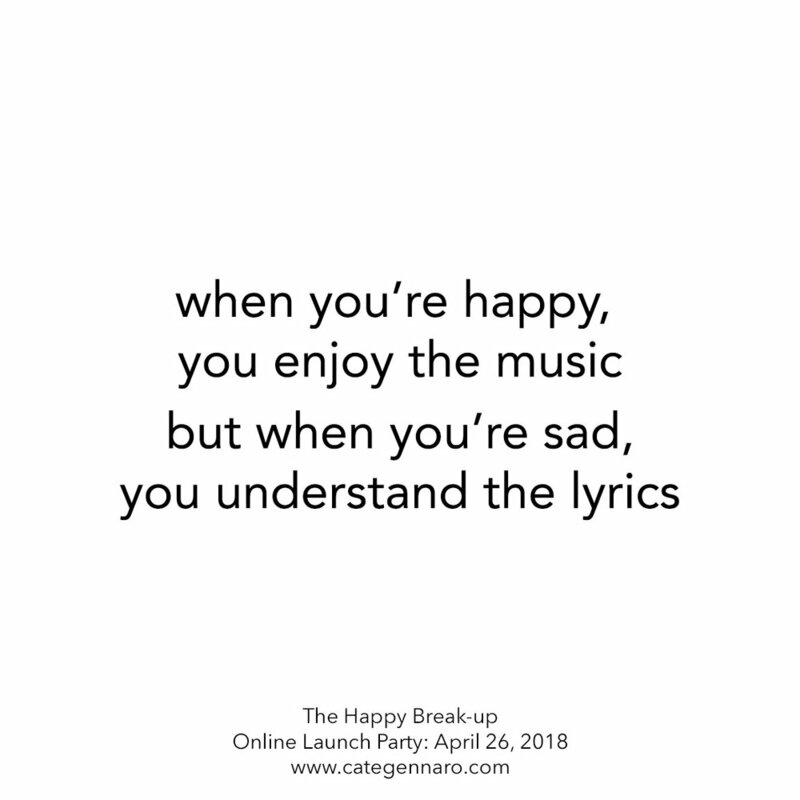 Or leave a comment right here with your favourite break-up song, for any of these lists! 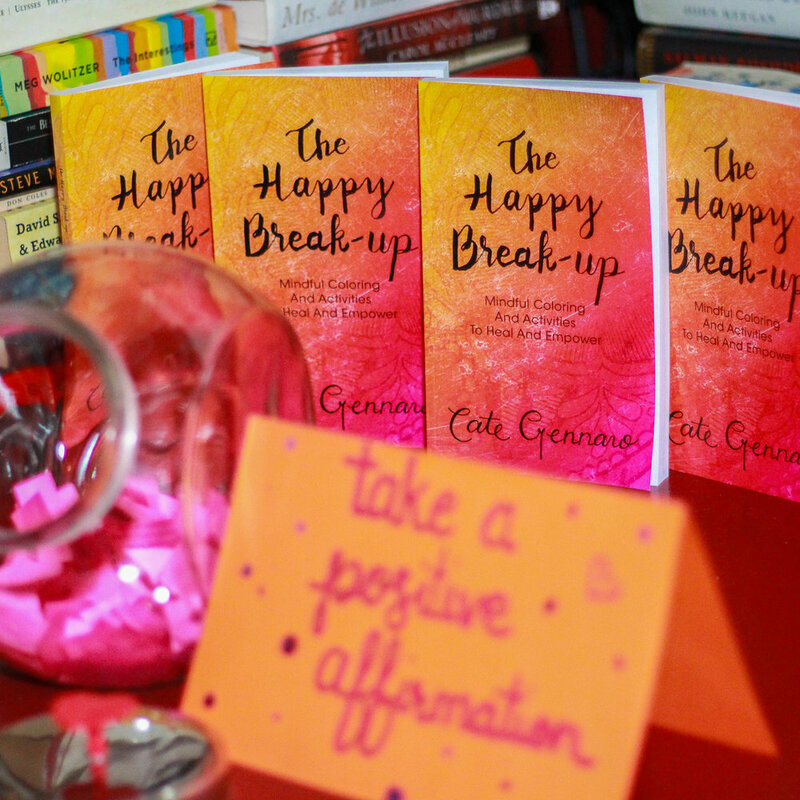 As we get closer to book launch day, I want to dive in a little bit deeper to some of the content you’ll find in The Happy Break-up. Every page in the book was well thought-out in order to help you achieve optimal levels of confidence post-breakup. 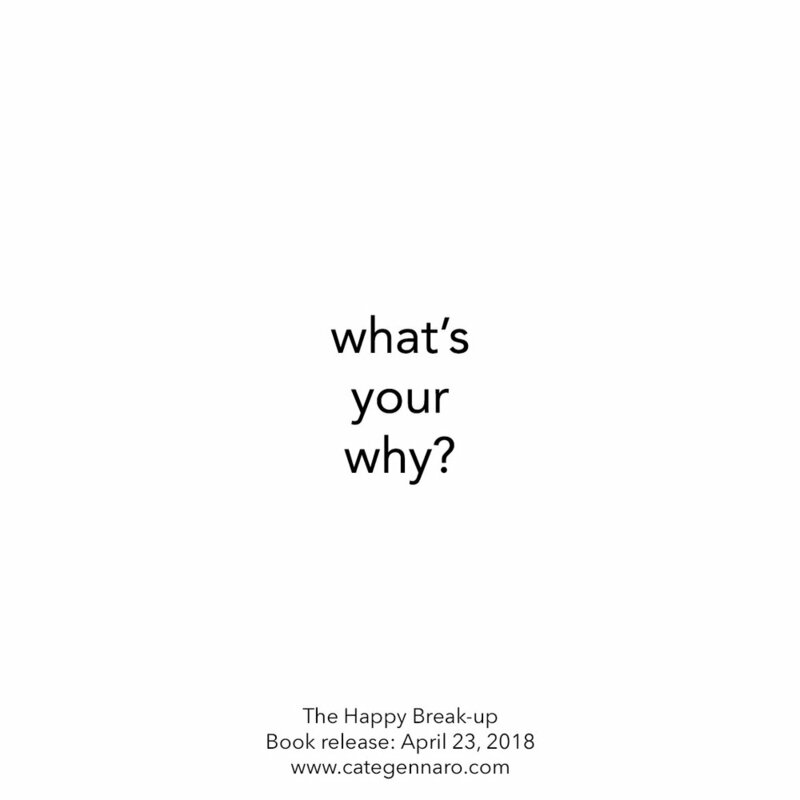 The book starts out by asking you this exact question – what’s your why? You may have heard this phrase before – the reason for it is to find your purpose, your drive, your motivation, your destiny. When you pick up The Happy Break-up, you’re making a decision to move beyond the initial sadness and heartache of a break-up, and get back to the fundamentals of YOU. Countless studies have shown that the absolute best motivation is an internal motivation. Finding that drive to encourage yourself, when no one else will, is essential to changing your thought patterns and behaviour. On this page of the book, I want you to reflect on why you’re doing this – why now? What is making you feel ready to move on? Having a WHY is the key to figuring out and enduring the HOW. Writing it down is key. You want to do this activity on a day that you’re feeling focused, energized, and wholeheartedly believe that you are ready to move on from this break-up. Why? Because this is the page that you’re going to come back to constantly – to remind yourself of why you’re doing all this heavy emotional baggage lifting. Though there may still be sad days ahead, or days where you feel defeated, having a written reminder of why you started this process in the first place can help turn a bad day into a good one, or just be a gentle nudge to make tomorrow a little bit better. If you feel comfortable, I’d love to hear what your “why” is – please share below in the comments! Ever since I dove headfirst into undertaking my masters program, while at the same time publishing a book, I’ve become a big researcher. So, as I began to think about The Happy Break-Up being published, I thought about what other topics are out there, about break-ups. Guys. There is SO much out there. Like, did you know that today, April 1, is one of the peak days for break-ups? Read on to find out why. According to Facebook, the absolute most common day for a break-up is December 11. Well, there’s a few theories out there. It’s two weeks until Christmas – perhaps there’s a fear of introducing your partner to the family? Maybe you find yourself shopping for holiday gifts, and you realize that you don’t want to spend the holidays with this person at all. Holidays bring out a lot of stress in people – sometimes the relationship just can’t handle the stress, and it becomes a casualty of the moment. Oddly (thankfully?) Christmas Day – December 25, is statistically the least likely day for couples to break up. So there’s something. Breaking up on the “most romantic” day of the year? Well, again, there is the stress of the holiday. Or sometimes, it’s a planned break. A partner decides that they want to get revenge, so they break up on a socially significant day. So – I’ve been pretty active on twitter recently, and I befriended a few younger Tweeters. Recently, they showed me some posts that exposed exactly what happens in Miami on Spring Break. I must say, I’m pretty glad I had never seen that before now. My eyes are scarred. But it totally makes sense that couples might break up before Spring Break, especially if they’re planning a wild trip. My thoughts on this? April Fool’s is a day for pranks. Perhaps there’s a few people out there who decide to “prank” their partner, only it’s not so much a prank. Splitsville just in time for some good weather! Finally, there’s a slight peak for breakups spread out throughout the summer months. Ahh summer – happy, free-loving spirits, wearing as minimal clothing as possible to cope with the summer heat. Wandering eyes might wonder what their missing, might be meeting new people at the beach or at a summer party, and might just be ready to cut themselves loose from the relationship ties. It makes sense. What do you think about these statistics? Have you ever broken up with someone, or been broken up with on one of these days? Life is full of cosmic coincidences – some are good, some are not so good. When people say, “everything happens for a reason,” it’s generally meant as a source of comfort – but how comforting is it, really? In the wake of a horrific tragedy, whether it’s on a personal or a worldly level, saying “everything happens for a reason” feeds powerlessness and complacency to a situation that may be completely random to begin with. Suppose, for a moment, we turn that statement around, and say, “I ascribe reason to the things that happen.” Now, we can take that random situation, and give it some thought. Instead of an arbitrary event, we can begin looking at the significance behind it – the causal chain of events, the human error and irrationality, or the freak accidents that led to it. And instead of assigning it an arbitrary meaning, we can ascribe our own meaning to it. How it specifically affected our own lives, and what we’re going to do about it. Suddenly, we find ourselves sitting in a position of power, rather than hopelessness. When we think about this in terms of a break-up, it makes sense that we would try to comfort ourselves in thinking that there’s some cosmic reason for our heartbreak that we just don’t understand. But when we determine our own reason, we can be mindful of the elements that led to the breakup. We can be aware of what we’re willing to accept in a future relationship, and where we draw the line. Take back your power and create your own meaning, because one thing I know for sure is that if you don't figure out the reason things keep happening, you are bound to encounter the same issues, over and over again. I want to pause for a moment to give thanks and be mindful of all the goodness that surrounds me on a daily basis. 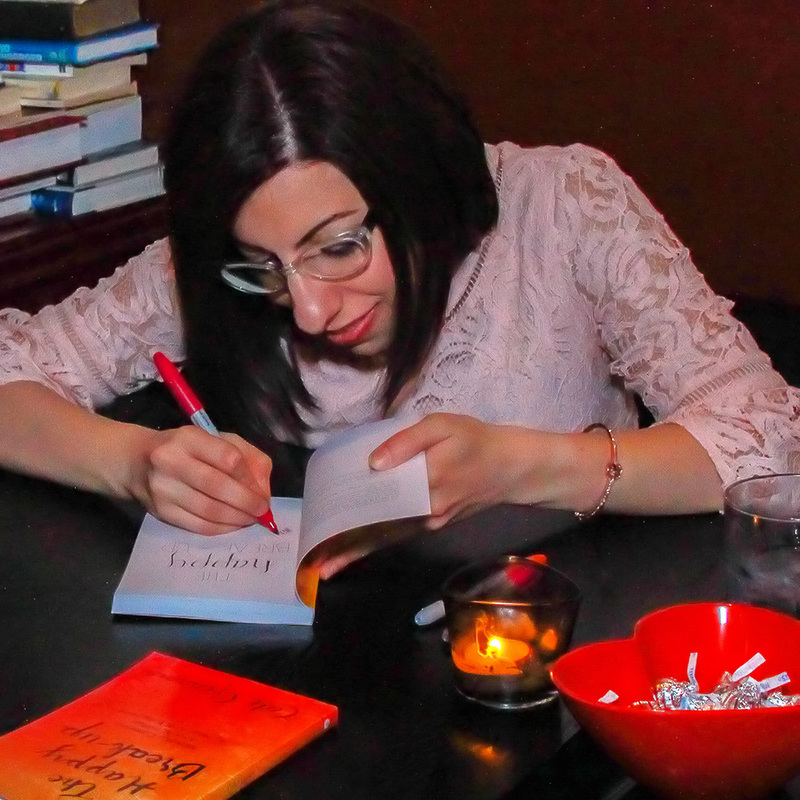 I began writing this post with the intention of saying thank you to all who have contributed to my pre-sale campaign for my book, The Happy Break-up. For all the calls, texts, and email messages of support that I received throughout this week. For all my friends and family who shared my project and invited their friends to support me as well. I am so grateful beyond words, for all of this. I don't even have the words to describe how full my heart is - and words don't often fail me! But I also feel the need to be thankful for my past. For all the tears, the broken heart, the so-called friends who tore me down when I thought I was already at my lowest. Because I now realize the part that all those tears played in my future. Those tears led me on a journey. A journey of self-discovery, of reimagining my life, and finding a value in myself that I had never known. They led me to a place where I am able to use my voice to advocate for others. To help people through their own darkest days. Those tears led me to a sense of purpose. My journey is likely not a unique one - I am not the only one who has found strength through utter defeat, and I won't be the last. But I am grateful for anyone that I meet in the future that will allow me to help them through that defeat, and find their strength, and their voice.